After the fall of the Soviet Union, many Communist statues and sculptures were destroyed, while others were moved to statue parks or museums. But many of them remained in the same place for the last 20 years, while the former Soviet areas were transformed into modern countries. Here are thirteen of the most incredible ones. Click to enlarge images below. 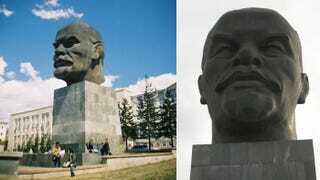 (pictured above) The 42 ton, 25 foot tall head of former Soviet leader Vladimir Lenin is standing in Ulan-Ude. Built in 1970, for the centennial of Lenin's birth. via Geoff Sowrey/Flickr and Nathan Messer/Flickr. The abandoned flying saucer-like Buzludzha Monument is in the middle of Bulgaria, a center of a national park. 150 years ago it was the place of the biggest battle between the Turks and the Bulgarian rebels. The symbol of the town is the memorial of the 1903 Ilinden rebellion. They fought against the Ottoman Empire. In honor of the rebellion this monument was constructed in 1974 by Jordan and Iskra Grabulovski. It is dedicated to the people of Moslavina during WWII. The memorial was designed by Dušan Džamonja in 1967. Created by Imre Varga in 1986. The Memento Park is one of the weirdest places on Earth. This outdoor museum is full of Communist era public statues which were removed from their original places after the fall of Communism. Part of the Museum of the Great Patriotic War. The whole structure is 102 m tall and the sword is 16 metres long, weighing more than 9 tons. It was built in 1981, designed by Yevgeny Vuchetich. It's a memorial complex for Soviet soldiers who fought during WWII. It was built on the 25th anniversary of the liberation of Belarus (1944). The architect was O. Stakhovich. This abandoned monument near the Croatian-Bosnian border symbolizes "the new freedom" for the Yugoslavian people. Dedicated to the victims of the 1915 Armenian Genocide carried out by the Turks. It was designed by Arthur Tarkhanyan, Sashur Kalasyan and Hovhannes Khachatryan. There is a 44 m high stele and 12 slabs in a circle, representing the 12 lost provinces. In the center there is a 1.5 m high eternal flame, dedicated to the 1.5 million Armenians killed. These are the most impressive horses ever, but the man driving the chariot doesn't care at all. Years after the fall of the Soviet Union, the kids smashed the statue's head off. It stayed with a crushed head covered with plastic bag for years, but finally the local Red Party members have pleased a sculptor to restore it. Well, there is something strange now with his head. In 1924 the Soviets began to erect giant monuments to Lenin, with this characteristic pointing hand and cap. Six years later, in 1930, Magnitorsk got a Lenin statue too, but a really weird one. Unfortunately the Saluting Robot Lenin was destroyed in 1932, so it is no longer standing. The photos were taken by the Life Magazine photographer Margaret Bourke-White in 1931. The 850,000 square foot complex has a 91 m high concrete and white marble tower with 27 small, weird looking statues of Turkmen heroes. There are some water fountains, pools, arches and sculptures too, and the Turkmens are building a new one every year. Elements of all buildings commemorate the independence date of Turkmenistan, 27 October 1991.